True blue best friends can be difficult to come by. I think that's what makes them all the more precious. From the day I met Kyrielle Wilson, we were undeniably the greatest pals. 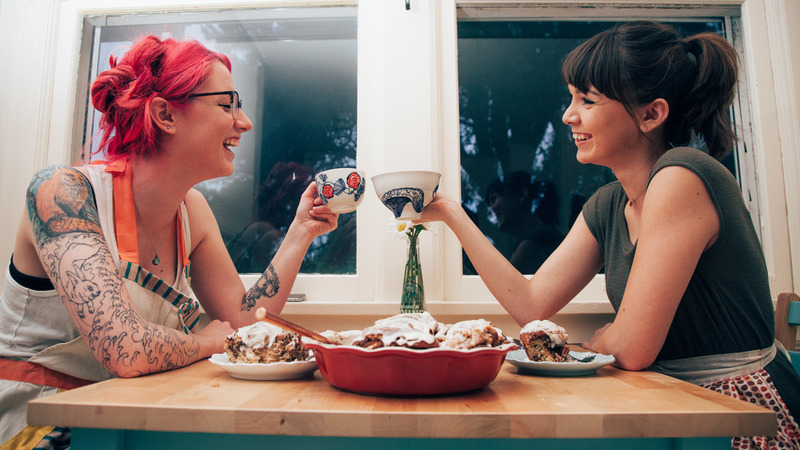 When I moved to another state, one of my biggest fears was that our friendship would falter. Could this special bond I had carefully built over the years stretch across the 1,139.7 miles, (yes, I looked it up,) without breaking? Well, for my birthday this year, I got my answer. My best friend was coming to town! As soon as we were together again, it was as if no time had passed at all. We picked right back up with our silly jokes and constant chatter, where laughter served as a more functional punctuation. All week we stayed up late. We played drunken Jenga and watched girly movies. We ate, drank, and were merry. Best of all we did what led to our friendship all those years back in Culinary School. We baked together. Neither of us can resist anything with coffee in it, and Kyrielle has a particular soft spot for cinnamon, so I dreamt up something to marry the two. The nice thing about this dough is that it only proofs once, helping to speed up the process. A few good kneading turns on a floured surface and your ready to roll! 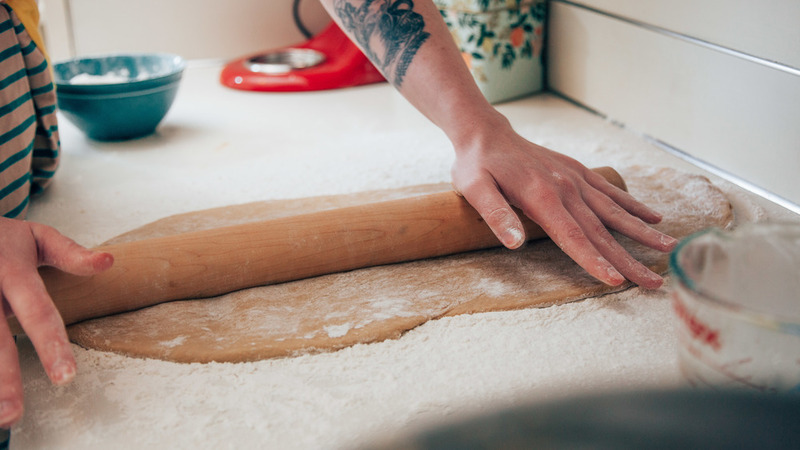 Use plenty of flour on both your rolling pin and your surface so your dough doesn't stick to it. Try to keep it a long rectangle with a nice and even thickness; that's the secret to a beautiful swirl in the end product. I took the flavors behind Mexican Hot Chocolate and the classic Cappuccino and rolled them into one super rich and decadent pastry. 'Rolled,' you get it? I seriously can't resist a terribly cheesy pun. The rich brown tone in this dough comes from replacing some of the milk with freshly brewed espresso. The depth of flavor it helps to create is otherworldly! The warm coffee notes get all cozy with the earthy cocoa powder, sweet brown sugar and spicy cinnamon in the filling. We added some pecans for a much needed crunch, chopping half to add to the filling, and leaving the rest whole to caramelize in the bottom on the dish. I'm kicking myself for not thinking to add some chocolate chips as well. Learn from my mistakes! When rolling the dough up, it's very important to keep an eye on how tight you roll them. Make sure to tuck it a little as you go, sort of like rolling up a sleeping bag. Too loose and all your delicious filling will fall out and create and saggy wilted roll. Too tight, however, and your rolls won't expand properly! Instead of growing outward, you'll get a dense roll with a peak in the center. One of my main tasks at the last bakery I worked at was to prepare all the morning pastries for the following day, which included cinnamon rolls. As you can imagine, I now have quite a bit of practice with these babies. We understand each other. They can seem a little daunting, especially if you've never made them before, but as long as you don't let the dough get too warm on the table and make nice clean cuts, you should end up with a very pretty pastry. Some people like to use unflavored dental floss to cut their rolls, so as not to squish the swirls shut, but I find that using a very sharp serrated or bread knife works very well also. The added perk of using a knife is that you can use the back of the blade to mark your cuts before committing. Measure twice, cut once, right? That way you don't end up with five giant rolls and one tiny one. Once you've cut all your rolls, you'll need something to bake them in, of course! Depending on your preferred sweet roll, you have a few different options here. If you like a very soft and gooey center, (like Kyrielle and I do,) you'll want to cram them all together in a casserole dish, or whatever you have that's similar. Do you prefer something a little more portable and on the well done side? A baking sheet with some parchment will work just fine. Now that the rolls are all tucked in and comfy, it's time for them to go take a little nap. My house is pretty chilly at times, and doesn't condone very good rising in yeasted rolls, so I did a little research and learned this nifty little trick of oven proofing! All you have to do is set your oven to it's lowest setting while you make the rolls, then once they're ready to proof, shut it off and set them inside! Perfect environment to get all warm and poofy in. So into the oven they go! Just make sure to take them back out before turning the oven back on to bake them. Look at those big, beautiful swirls studded with pecan pieces! They'll rest a bit at room temperature before going back into the oven to bake. If you wanted to make these for breakfast, but don't feel like waking up at the crack of dawn to have them done in time, just do everything up to this point the night before and refrigerate the rolls overnight. Kyrielle and I couldn't wait, so we whipped up a tasty glaze to smother the rolls in and chatted a bit as they baked away. There's nothing like having a friend to pass the time with while something's in the oven. Before you know it, your timer's going off and 45 minutes have gone by in an instant. While Kyrielle glazed away I brewed us some espresso and tried to exercise some dignity and restraint. Those rolls were calling my name! I had to have one! The first few bites we took, we were both speechless. Savoring the sweet swirls in silence. That's how good they turned out! Even Bean wanted a bite. Now that is a look of determination. Some may say that one of the best parts of this tasty pastry were the warm and toasty caramelized pecans from the bottom of the pan. While they're not wrong, I think I'd have to go the more sentimental route and say the best part was getting to share this with my best friend. Putting our efforts together into our mutual passion is something you just can't replicate with anything else. As the week drew to a close and we said our tearful goodbyes, I thought about how lucky I am to have such a special friendship. I've got some big changes coming up in the summer months. Pretty soon it'll be time once again to pack up and move, although this time we are at least staying in the same state. No matter what gets thrown at me though, I know that I'll get by with a little help from my friends. Try adding chocolate chips to the filling as well as chopped pecans! Turn on your oven to its lowest setting. Heat up your milk until it is almost too hot to touch. 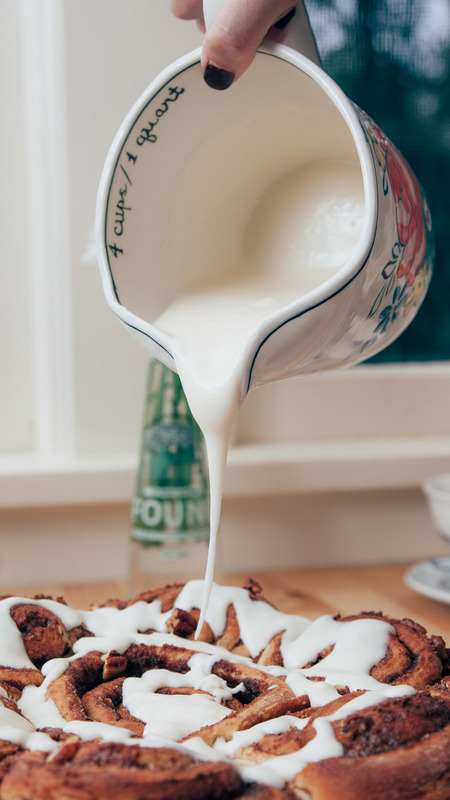 In the bowl of your stand mixer, combine the sugar, hot milk, and espresso, stirring to dissolve the sugar. Add your yeast and allow to dissolve and become foamy, stirring occasionally. In a medium sized mixing bowl, combine all the ingredients of the filling, mix together thoroughly and set aside. Add the melted butter and beaten egg, using the dough hook attachment to stir together. Add your flour, and allow to mix until all flour has been combined and the dough begins to pull away from the bowl. Turn the dough out onto a well floured surface and knead until it no longer sticks to your hands and has become slightly more elastic. Shape roughly into a rectangle and sprinkle more flour on top of the dough and your rolling pin. Roll your dough into a long rectangle with an even thickness throughout. Brush off any excess flour before brushing on the melted butter. Evenly brush the butter over the whole top of the dough, you may not need all of it, but make sure it is generously coated. Sprinkle the filling to cover all the melted butter, making a very thick layer. Reserve some of the filling to put into the bottom of your baking dish or pan with the whole pecans. Press the filling in firmly into the dough. Begin rolling the dough, tucking throughout, as you would when rolling a sleeping bag. Once you have rolled the dough, cut your rolls using either unflavored dental floss or a serrated knife. Place the cut rolls into your desired baking vessel, spacing further apart for a drier roll, or closer together for a softer roll. Shut off your oven and place the rolls inside, allowing to rise in the residual heat for about 45 minutes. Once they have proofed, remove from the oven and allow to rest at room temperature as you preheat your oven to 350F. Bake for about 45 minutes to an hour, depending on size and desired level of doneness. Allow to cool to room temperature before glazing. As your rolls are cooling, beat together your butter and cream cheese until nice and combined. Add the extracts and powdered sugar and mix well, using the milk to adjust the thickness of the glaze. Once your rolls have cooled, pour the glaze all over, spreading with a spatula or butter knife until they are covered. These rolls don’t last long, they are best served day of, but will keep about two days if kept airtight.